It's that time of year for us-- we have begun diving head first into multiplication. 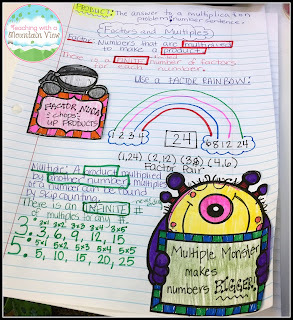 Since I teach 4th grade, that means reviewing the basics of multiplication that they learned last year AND teaching them multi-digit multiplication. It's always a doozy of a unit! I've posted about teaching multi-digit multiplication before, but I haven't posted much about the very beginning of the unit. You can read my previous post HERE. 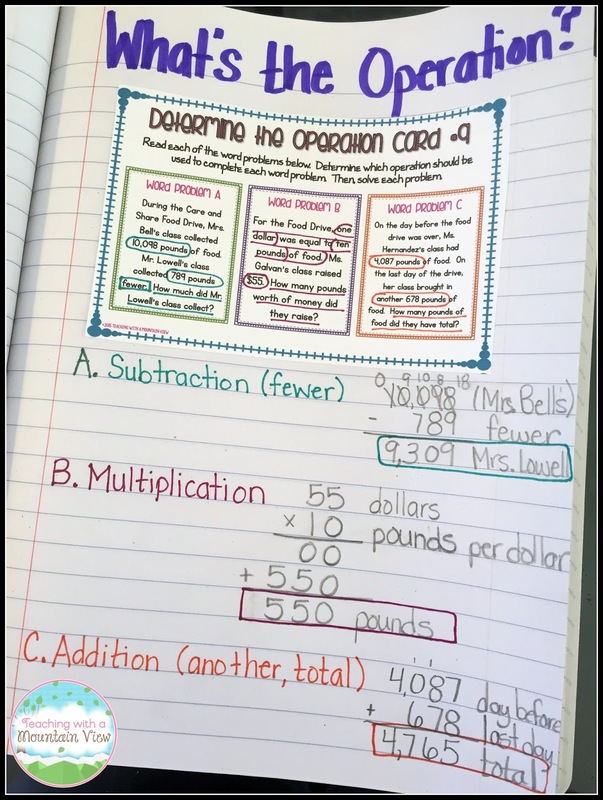 It includes a lot more activities and anchor charts to help you through your multiplication unit! I always try to introduce my new units with some sort of inquiry-based work. 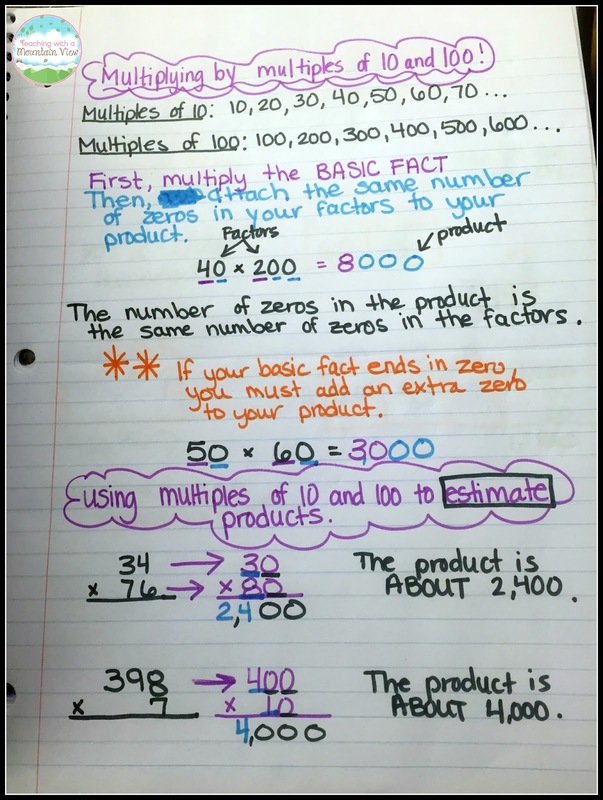 I needed something quick and easy to get my kids thinking about factors and multiples (without actually telling them that's what they were using). I put my kids in partners and gave them each this page and asked them to answer each question, in any way they could. I loved seeing all of their different answers! 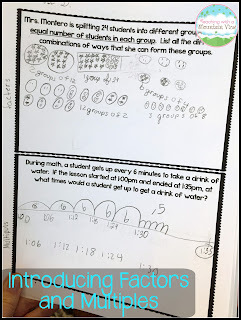 It made it really easy to introduce the concept of factors and multiples after they had done it. You can grab the page HERE. I LOVE introducing factors and multiples because I get to be incredibly dramatic! The MULTIPLE MONSTER and the FACTOR NINJA are such an integral part of helping my students recall what each one means. We all stand up and act like ninjas and shout, "Factor Ninja CHOPS UP PRODUCTS!" and then put on our scariest voices, bend down to the floor and gradually raise up and get bigger while shouting, "Multiple Monster MAKES NUMBERS BIGGER!" They LOVE it. We made this fun notebook page together and had a lot of fun chopping up factors and being monsters to make our multiples. If you've never tried it, I highly recommend it. Our last unit was on elapsed time, and it was the first time we played Jenga to review. (Read more about that HERE.) The kids loved it so much that I knew I had to find more ways to incorporate it. 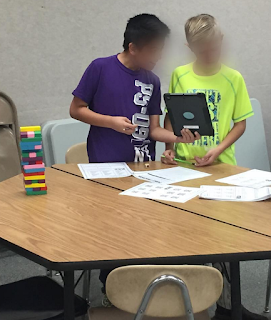 Reviewing factors and multiples seemed like the perfect time to create another one, and they had a BLAST! You can get the already colored game blocks on Amazon HERE. You can see the Factors and Multiples game HERE. 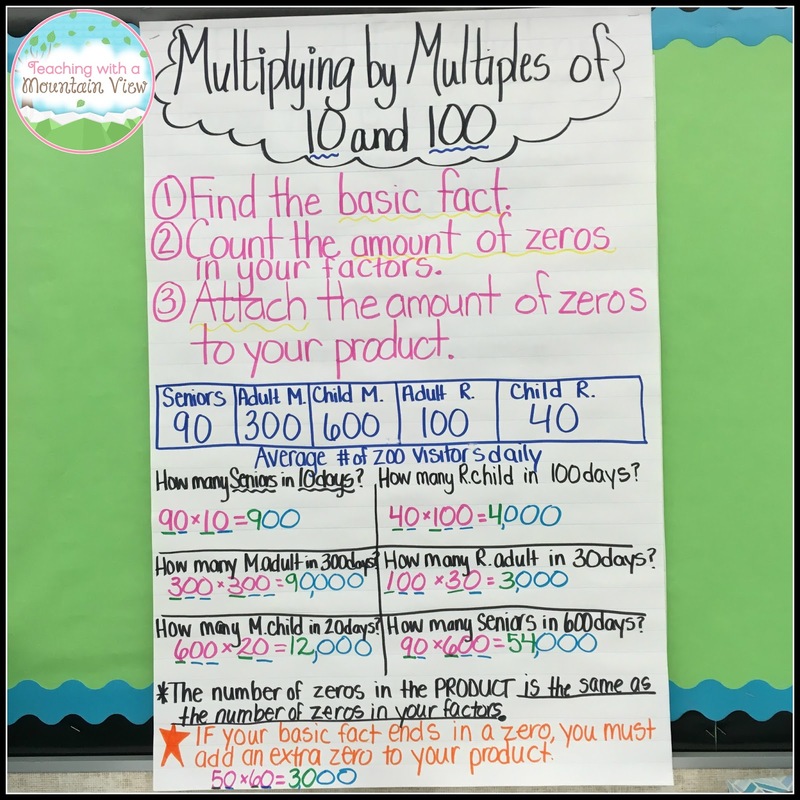 Before I can move on and start teaching various strategies and algorithms for multi-digit multiplication, I HAVE to teach my kids how to multiply by multiples of 10 and 100. This is so crucial for students to be able to do mentally! 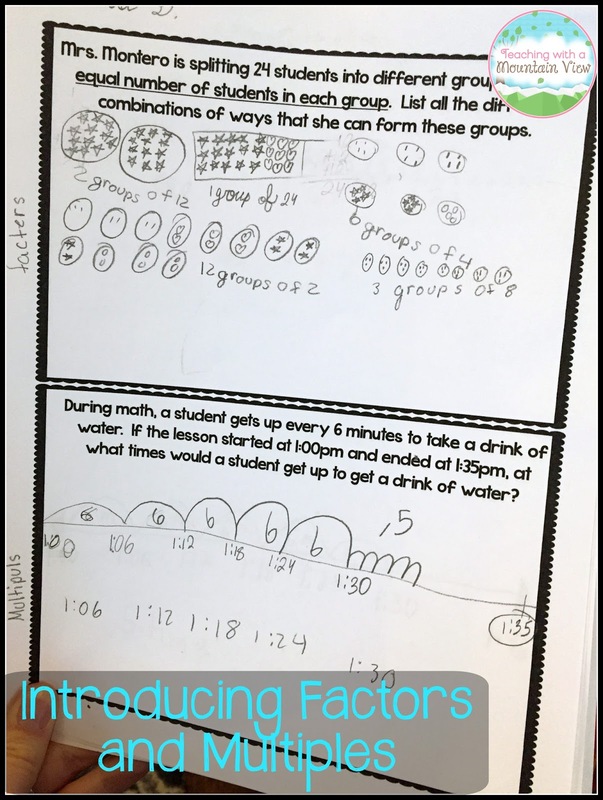 It also helps them immensely with partial products and the box and cluster method and helps them to estimate whether an answer is reasonable. 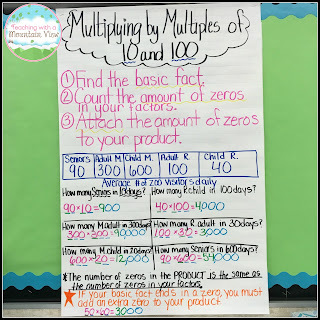 Here is the anchor chart I use to teach multiplying by Multiples of 10 and 100. We do all of this together, and then take notes via the notebook page below. The Adult M and Child M stands for Adult MEMBERS and Child MEMBERS. I just ran out of room to write them this year! 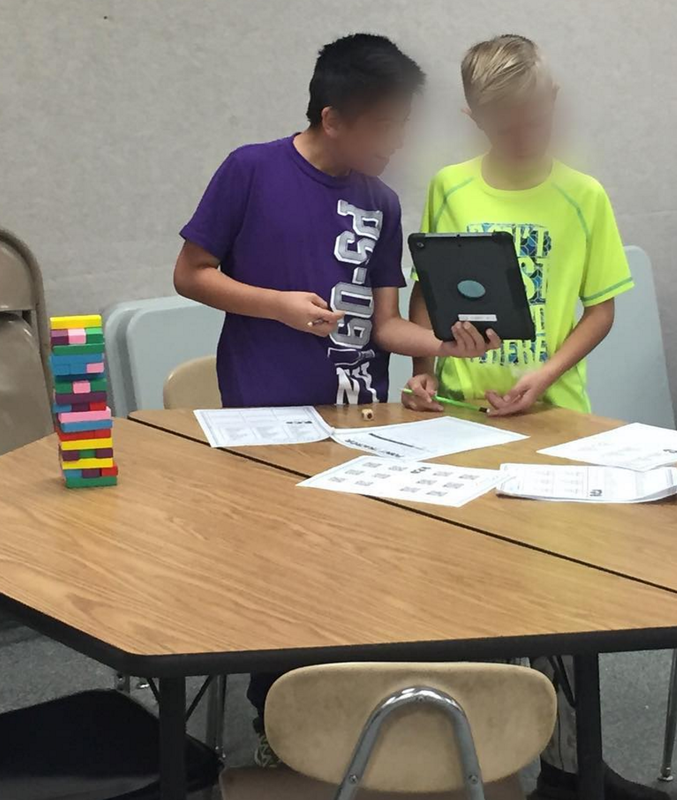 A few months ago, I saw a most fantastic idea from Teach Like You Mean It on Instagram. It has quickly become another favorite way to practice our math facts! It's super simple. My students LOVE practicing their math facts with this fun relay race! The kids are in two lines and have to compete relay-race style to get all of the facts correct. The numbers 1-12 are on each team's side of the board and then they have a number (in this case it was +7, but you can adapt it to multiplication very easily) to add to each number. 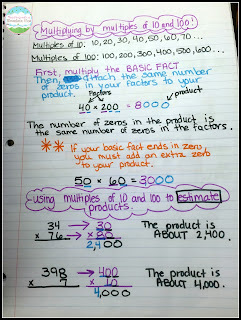 SO easy to adapt to addition, subtraction, and multiplication! Every year, I very quickly realize that my students need extensive practice in determining when to add, subtract, and multiply. They catch on to the fact that when it's time to learn multiplication, all of the word problems we are working on involve multiplication. Last year, I created these Determine the Operation Task Cards. They are unique because each card has THREE problems about the same topic. Each problem uses a different operation. 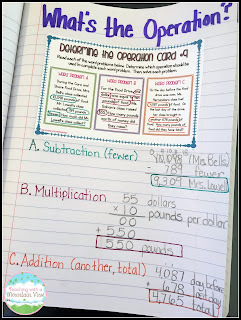 It is a great way to show students that various situations can require different operations, and it gives them a lot of practice in pulling out key word, details, and figuring out which operation is best. Find the Task Cards HERE. 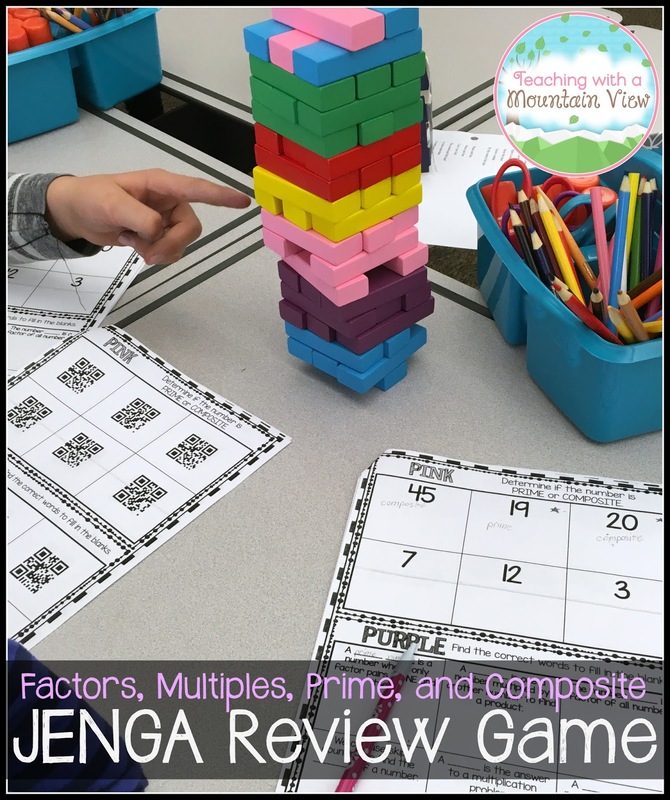 This week, I received an email from a very sweet reader who had created her own version of the above Jenga game for two-digit multiplication. She so kindly agreed to let me share it with you all so that even more teachers could benefit from her wonderful work! I absolutely can't wait to use it! You can download the game HERE and use it in your classrooms. You'll need the colored Jenga blocks again. Remember, you can get those HERE. Thanks so much to Rebecca Beecher. You can find Rebecca on Instagram at The Sunny Side of Teaching.